Greetings! Kim McCool here. 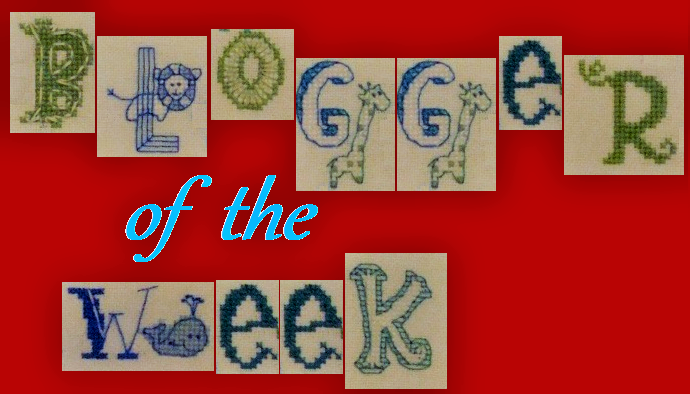 I want to thank Jo for thinking of me and inviting me to participate in the “Blogger of the Week”. I live in the middle of the USA in the state of Iowa. My husband and I live on a small farm. He’s the groundskeeper, I’m the house help <G>. We have an upper garden, a lower garden, orchard, greenhouse, 25+ acres of tillable land, the other 25 are woods. DH and I have lived here for 20 years and have worked to create an environment for wildlife. On any given day we see deer, fox, coyotes, turkey, hummingbirds, and a multitude of other birds throughout the seasons. We’ve even had a pair of mountain goats (YEP, mountain goats) show up in our front yard. Our farm overlooks the Mississippi River Valley and in the winter we see the majestic bald eagles flying overhead or perching in our trees. I have a daughter (34) and a grandson (3) living in Atlanta. DD is a professor at Georgia State University. My step son, wife and three children live in Michigan (over 10 hour drive) and a step daughter lives across the river from us. All are great kids and we love seeing them all whenever their busy schedules allow. Of course, I can’t go without mentioning our two schnauzers - Emma (my lap dog) is a 5 pound teacup Schnauzer and our 85 pound GIANT Schnauzer, Bella (DH’s “REAL dog <g>). Don’t know what we’d do without them. I started stitching when I was in fourth grade when I was 9 years old….so I’ve been stitching for over 52 years (COUGH!). My parents and I lived out in the country , my closest playmate was 5 miles away, so Mom needed to keep my busy. A good friend owned a knitting shop (I learned to knit from her, too). In the shop was a canvas of a ladybug - the hole count was probably 3 holes to the inch - it was HUGE. That was my very first project and I immediately fell in love with the process. 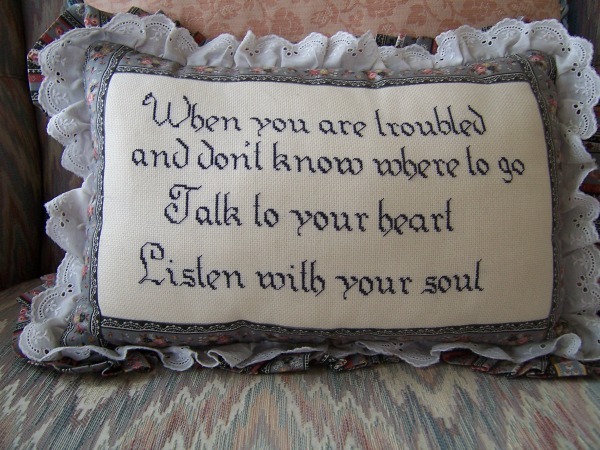 I started my blog in 2013 with the encouragement of LynnB of Happiness is Crosstitching. An interesting factoid - I’M A OAAT eater….so I guess that’s spilled over into my stitching style. Yep - definitely a OAAT stitcher. I love classic things - Little House Needleworks and pretty much anything to do with horses, dogs, Tudor-related themes, romance - I’m a romantic at heart. This is a difficult question to answer. I can look at each piece and it brings back memories of when I stitched it - both happy and bittersweet. The best way I can answer this question is each piece is a reflection of me. Currently I’m attempting to go through our home, documenting each piece in a notebook for my DD so she will know the story behind them. When I’m no longer here, she will be able to look at the stories and, maybe, feel me there sharing each tale. The worst one was knitting a miniature (1:12) scale sweater. I was ¾ of the way done, knitting along, oblivious to the world around me. Suddenly Bella, our Giant Schnauzer, EXPLODED - barking at aliens who were invading the house. (NOTE: There were no aliens to be found). I was so startled, most of the stitches came off the needles….I haven’t had the inclination to start one again. I’ve been learning to sculpt, sculpting fairies, mermaids and wee little ones with polymer clay. I’d like to try my hand at sculpting horses next. 9. Do you have a box of finished-but-not-fully-finished pieces? Oh yes…..about a dozen of them - stitched and begging to be finished into something. 10. What's your favourite way to fully finish a project and what do you do with them? It depends on the project. Sometimes they’re made to hang on door or drawer handles, some are pillows, some standalone, some framed. 11. Which of your projects most represents "you"? 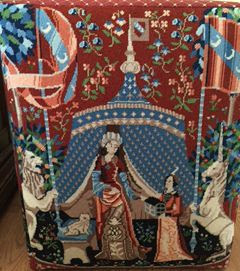 My “me” project is the needlepoint footstool with panels from the Cluny Tapestry. 12. Tell us a secret about yourself. Or a joke. About anything! I love Sci-Fy. I’m a huge fan of Dr. Who, Star Trek, Fringe, Eureka, Grimm, Once Upon a Time, etc. BUT……..I’ve never seen, nor read, any of the Harry Potter stories. Kim your stitching and creative works are beautiful. Love seeing all that you do. I love what you do and you are an inspiration. Get well soon!AriadnefromGreece! Thank you, Ariadne! I'm hoping to stitch today....we'll see how it goes. Kim I definitely recommend you listen to the Harry Potter books. They are excellent and narrated by Stephen Fry. Sounds like a great recommendation! I'll look into getting them. What an interesting post about Kim! I was lucky to receive one of her 60 RAKs and it's absolutely beautiful. Hope you are better soon Kim and crafting again! Thank you, Justine! I browsed through the RAKs......I can't believe I made all of them! GEEZ, I sure was busy! So happy you liked your gift. Kim your farm sounds so wonderful. Hi, Vickie - we absolutely love it here. Awesome post. It's nice to hear all about you! I have to admit to being more than a bit jealous of your gardens and space. Thank you - I was honored Jo asked me to be part of this. I love all the people I've met through blogging. Amazing ladies and good friends. Hey, I think I know you! :D/ I received one of your 60 RAKs and the little blocks are at home on my stash chest. I love your description of your farm. My husband and I hope to have that at some point too. Is Harry Potter considered Sci-Fi? I can't recommend the movies though I love the books. Great to meet you, too! Documenting everything can get a bit overwhelming, but it's worth doing for her. Hi Kim, I hope your hand is healed, I know how frustrating that is, I broke mine 1 1/2 years ago and I managed to stitch with my left hand but slow going. Your home location sounds idyllic!! Your favorite piece is amazing!! I can't imagine how long that took to do, it's stunning! I Hope you don't put your feet on it! Hi, Mary! Nice to meet you. Thank you for your lovely comments. I love to make things - and share with others. Hope you enjoy my blog - do you have one? You live in a beautiful place Kim,with all the wildlife to see...wonderful. I enjoyed seeing a few of your stitched pieces and learning a bit about you. I do hope that your hand heals well. Thank you, Lesley. We love it here. Glad my husband likes to work outdoors.....not my cup of tea.....but we compliment each other. Great answers. I have to comment though on your last answer. I'm the same way. I love all the same shows you said but I've never read Harry Potter. I have seen a few of the movies and they were okay. People always assume I would love them too haha. Lovely post, pleased to meet you Kim. Your footstool is amazing. Thank you for stopping by and leaving a comment. The footstool is actually in our sunroom and gets **NO** feet resting on it - HA! Hi Kim, nice to meet you! I love the idea of documenting everything you stitched and the story behind it...and I admire your RAK project, so much generosity! Thank you so much, Leonore. I have so many things I've stitched decorating our home, it's going to take awhile - HA! Nice to know more about you, Kim:) Farm and Sci-fi are new things I did not know about you. Hi, Pretti! I'm enjoying reading about other bloggers, too. HI, Carol - thank you for leaving a comment - I'm thoroughly enjoying learning about other stitching friends, too. You do some really great work and I love your creativity. Hello, Brigette! Thank you for your kind words. Nice to meet you Kim. I truly admire your footstool, how gorgeous and I can see why you are proud of it. Very nice to meet you. 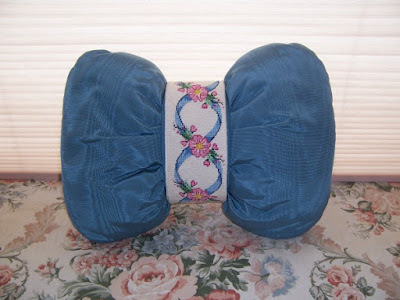 Your footstool is amazing and your sculpted fairies on your blog are so pretty.